Sicario: Day of the Soldado is both a summer movie potboiler and a heated conversation starter. At first blush, Sicario isn’t exactly a movie demanding a sequel. More of a critical than commercial success, it’s an intense look at the nefarious and brutal machinations of Mexico’s drug cartels. Rooted in research by screenwriter Taylor Sheridan (Hell or High Water), while it’s technically well done with great cinematography, effective acting and an innovative score, it also feels a little bit like watching someone else’s homework play out on the big screen. Then again, that can be said of other movies from director Denis Villeneuve, particularly Arrival and Blade Runner 2049. Widely praised as they are, they’re also rather clinical and a bit of a grind to watch. Now, with Day of the Soldado, Taylor Sheridan returns with a story that feels much more like a serious topic given the Hollywood treatment. And it works. Really well. As helmed by Italian director Stefano Sollima (behind several episodes of the well-regarded Gomorrah TV series), Day of the Soldado channels Sergio Leone rather than Ken Burns. In many respects, this sequel is more thematically rich and textured than its progenitor. The politics go much deeper and the situations run wildly more ambiguous. The lines blur. Notions of right and wrong intermingle. And, no doubt, that’s how things work in reality. It’s not all sound bites, pleasantries and accessible photo ops. It doesn’t matter in which direction any part of the media tries to spin it or which political party is leading the fray. Some things cut deep and then fester while administrations and policies change. A lot happens while nobody’s watching. Soldado takes place in a fuzzy (cinematically) timeframe. Comments are made as to the cowardly stance of POTUS in regard to shoring up immigration laws. With the administration left nameless and given the state of affairs with Donald Trump in office, those blatantly political comments generate snickers. And one’s general comfort level with the material will certainly be driven to some extent by personal alignments, beliefs and leanings. For some, the idea of a Yemeni terrorist — undermined by U.S. travel restrictions — piggybacking on the network of a Mexican drug cartel in order to — by illegal means — cross the U.S. border is pure fantasy and fear-mongering. But. Reality says there’s more truth to it than is comfortable to admit. During one interrogation, the U.S. and its complex rules of engagement are exposed as a gateway for opportunists. But the complexities flare up in a number of different pockets, as it’s later revealed the attempt to squash one movement was misguided — the perpetrators turned out to be homegrown terrorists, born and bred within the U.S. There are some heavy-duty themes and ideas going on in Soldado, a rarity for a major summertime movie release these days. But the intensity of the grim subject matter is balanced with the theatricality of the returning characters, Matt (Josh Brolin, Deadpool 2) and Alejandro (Benicio Del Toro, Star Wars: The Last Jedi). They see their partnership taken into some dark, complex psychological terrain. Alejandro, in particular, rises as a singular symbol. He’s part Bruce Wayne (avenging the loss of his family to a cartel) and part Chuck Norris (think of that pickup scene in Lone Wolf McQuade — buried alive, near death, armed only with a can of beer and a gas pedal). Soldado goes global and the action goes all kinds of sideways. Counter-terrorism is only one arc of the story. Things really fall apart (for the characters, not the movie) when a Mexican cartel kingpin’s daughter is kidnapped by U.S. agents in an effort to pit the cartels against each other. Let the bad guys annihilate each other and watch it all go down from the sidelines. If only things were that simple and predictable. Soldado’s lack of predictability is merely one factor in its success. 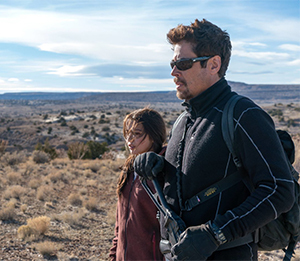 This unexpected Sicario series has found its footing and there’s plenty of room for it to grow.